Even with the huge variety of options that one has as an English teacher, it can still be hard to come up with ways of teaching that can shake adolescents out of their “I don’t care” coma. I mean, let’s be honest: most high school students are far more concerned with showing off and meeting new people than they are concerned about discussing literature. But wait! What if those two were one and the same? Now we’re getting somewhere. I was dying to try this in my own classroom, but I wasn’t sure who to collaborate with. I really wanted to expose my students to another class outside of Milwaukee, somewhere that would expand their understanding of the world beyond their own backyard. Most of my friends teach in the city, so I tried to open my brain. Who did I know that taught somewhere… else? Then, it hit me. Of course! My cousin, about 7 years older than I, teaches English at a high school in rural Oregon. Now that’s far away. I shot off an email, and, lo and behold, she teaches seniors, too. And she liked the collaboration idea. Over winter break, after Grandma’s delicious Christmas dinner, Ms. W. and I were able to sit down on the couch together, face to face, and create an initial to-do list for a collaborative unit on Zora Neal-Hurston’s Their Eyes Were Watching God. While we still have a couple months of preparation ahead, the cogs are turning and it’s looking like we’re going to be connecting kids not just between a rural setting and an urban one, but over whole regions of the country. I am so excited to give my students the opportunity to discuss a text with some new faces–ones that will seem different at first, but that will inevitably become familiar as they explore the text with other kids all the way across the nation. Wish us luck! As a teacher who is always trying to be innovative, creative, and just plain “not boring,” I try a lot of different types of lessons with my students. As a new teacher, I have a lot of lesson attempts that need fine-tuning, and a handful of utter flops. However, there is one strategy when it comes to literature lessons that–even in my short experience–has never let me down. It works with practically any fictional text and any age group. This strategy (which I definitely am not the first to come up with) is character letters. In a character letter assignment, students write a letter to a character, usually for a very specific purpose. I think the secret of this assignment’s vast success lies in the fact that it’s very entertaining for students, yet very informative for the teacher. As I inspect textual references, tone, and reactions in their writing, I can tell quite a bit about how my students are understanding and interacting with their reading. Also, the products are often hilarious and spot-on. Let me tell you just a little bit about how I’ve used this teaching method. Variations: Students can write in their own voice to a character, or from one character to another. You can assign student pairs to write to each other and respond back, still in their character roles. You can have students, individually or in pairs, create an instant message conversation between characters (they have a great time creating screennames and such). Students can read examples aloud to the class, while others try to guess which character is speaking and who’s being addressed. You can have students write diary entries in the voice of a character. The list goes on. Basically, the goal is to create an assignment that asks students to assume the role of a character and to react to that character and others as if they were real people. You’ll be surprised at the strength of emotion that quickly surfaces! Examples: Here are some concrete examples of character letter assignments that my students have tried. *Beloved. Write a letter from one character that lives in House 124 to another that also resides in the house. This should be a letter of apology or one that reveals a previously hidden emotion. Refer to at least one specific incident from the text. Your letter should be written so that it would be given to the recipient directly after this event. *Hamlet. While examining the tragic form, we’ve learned that tragic heroes have a flaw that leads them to their doom. So what’s Hamlet’s problem? We’ve all been in the situation where we see a friend making some bad decisions that could create even worse consequences. Write a letter to Hamlet, telling him what he’s done wrong, and what might happen if he doesn’t set it right. *The Pearl. We don’t see our protagonists say much to each other throughout the story. What would they say if they had the time? In pairs, assign one person to assume the role of Juana and one person to assume the role of Kino. Write a letter as your character to the other, explaining everything you want to say. Once done, exchange with your partner. 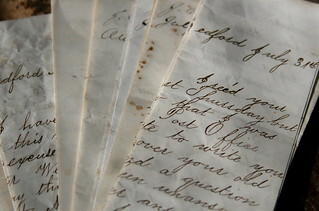 Keeping yourself in character, write a response to what he or she has written. *Pride and Prejudice. While most of the verbal sparring we see in the book takes place via conversation or letters, if Elizabeth were alive today, it’s likely she’d find a lot of her drama online. Pick any character from the novel and write an email from this character to another. This should be a serious message of at least two paragraphs. Please feel free to use modern English and online abbreviations to create a message that stays true to the way the characters interact in the novel. Try it! As you can probably already tell, there are tons of different ways to transform this assignment type to your purposes. Try it out, and you’ll likely be delighted at the entertaining, heartfelt, and shockingly accurate character portrayals that your students create. Whether you’re working it into a complex unit plan, or just need something new to keep your kids on their toes, character letters are an awesome way to go.